and a sunshade that helps keep you cool during those hot days of summer. Patriot features two available powerful flip-down liftgate speakers (included with the Premium Sound Group or the Sun and Sound Group) that let you take your music outdoors. When the rear hatch is open, the speaker unit can swing down to project music for the surrounding outside world to hear. You can choose between a standard four-speaker audio system or an available 368-watt, nine-speaker Boston Acoustics® Premium Sound System with subwoofer. 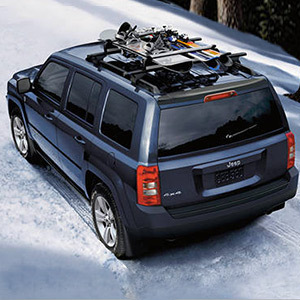 From city streets to off-road trails, Patriot has the wheels you want, for both on- and off-road performance. A tire pressure monitoring display system is also available (a warning system is standard) along with a full-size spare tire with the Trailer Tow Prep Group or the Freedom Drive II® Off-Road Group.